I know that most South African spearfishermen have either dived Mozambique’s waters or have plans to do it in the future. I am no different. 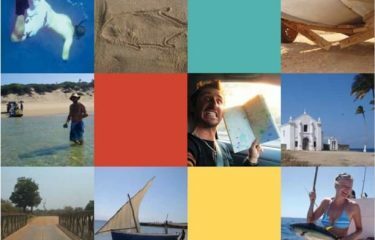 Mozambique has always been at the top on my list of places to dive due to its accessibility to South Africans, as well as all the stories and pictures I had seen and heard. 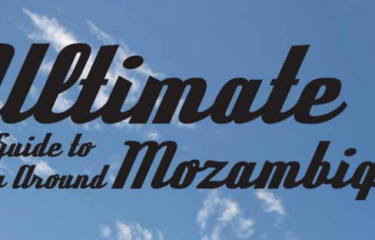 So, when Richard called me in August 2010 to see if I would be interested in a trip to Moz, I didn’t have to think too hard before saying yes. It was not even half an hour before I had arranged things with the Mrs and the Boss, and the planning and day dreaming began. The primary aim of the trip was to get footage for the One Fish series, so it wouldn’t be all play and no work. But how one could call anything spear-related work, I don’t know. Our host for the duration of our stay in Mozambique was going to be Emiliano Finocchi. Emiliano lives in Maputo and is a passionate and accomplished diver. The team for the trip consisted of Grant Somers (our underwater videographer), Richard Leonard (from In the Zone, who was leading us on the adventure), Richard Hammon (no not the little guy from Top Gear, but our boat videographer) and myself, also an underwater videographer. Despite my expectations, the trip from Durban to Maputo went quickly and was highly uneventful. On arriving in Maputo, we met up with Emiliano, who showed us to our hotel. Seeing our accommodation, I realised for the first time that this trip was to be different to any other spearing trip I had ever done, and that my expectations of the Mozambique I’d seen in photos were about to be turned upside down. Beautiful palm fringed beaches accessible only by 4X4 were replaced by high-rise buildings. Instead of a thatched beachside cottage we had an air conditioned hotel room, and the sound of the ocean would be drowned out by the hustle and bustle of urban movement. We were in the heart of the capital city of Mozambique: Maputo. What an adventure it would be! Finally the first morning of diving arrived. We organised the cameras, gear and guns and stepped into the elevator with some local hotel staff looking at us as if we were crazy. Emiliano took us to the boatyard and before long we were geared up and heading out to sea. We only got onto the water at around 7am, very different to the crack of dawn raids that we were all used to. We headed far north to a spot that Emiliano recently heard about from a fishing friend, that had very likely only been dived a handful of times. When we arrived the fish finder screen was full. It looked like there were fish everywhere, sending our heart rates through the roof. Months of planning and strategising and finally it was time to plunge into the deep. As we slid off the boat and started to drift over the pinnacle, Emiliano and Grant were greeted by a huge shoal of Yellow Fin Trevally and beneath them GT’s all swimming in crystal clean water. Emiliano quickly said to him, “Lets leave the Trevally for now because there are some amazing Snapper down there”. It must have been tough to swim past all those fish and onto the bottoms. The plan for that day was to go far north and drift back with the current along the reef, and then jump back on the boat and continue south to other spots, each spot giving us a new chance at shooting great fish. At the next reef we found large numbers of Yellowfin Tuna chasing bait fish around the surface. We tried for a while to shoot the Yellow Fin, but they were swimming way too fast. So we decided to concentrate on the reef fish below. Luckily I had climbed in with both camera and my gun. As Emiliano surfaced from his first down he had a nice Snapper on his spear, a large Couta came swimming in to see what the commotion was about. I had just surfaced from filming Emiliano’s fight and was alerted by some snorkels screams as to the presence of a large fish. I took a shot and all I can say is wow! I landed my personal best Couta of about 23kg with the first shot I’d fired on the trip! Up to then I had been filming Richard and he had a couple of nice fish on the boat. To say that I had been itching to spear something was an understatement… but it was well worth the wait. That first day was incredible. Between Emiliano and Richard a few double digit Golden Trevallies, some really nice bottoms, a good Queen Fish and my Couta. Grant and I also saw lots of great fish that we shot, not with our spears but with the camera. After a day’s rest we were back on the water, this time with a friend of Emiliano while he attended to some business. This second day of diving saw Richard nearly losing a gun after shooting a Wahoo with a reel gun and letting it go. He had only recently switched from float lines and was accustomed to releasing the gun after shooting. Fortunately the drag on the reel was loose and he managed to swim after it and grab the handle before the fish swam away. Some more Golden Trevallies and a great Coral Trout that Rich took off one of the wrecks followed at our next spot. Later, while Rich was busy boating another Golden Trevally, I grabbed a gun and shot a nice Queen Fish. As it sped off away from the reef I witnessed a very large Brindle Bass chasing my speared fish, swimming at an amazing speed for such a big animal. It engulfed my whole fish with one opening of its huge mouth! I swam along my line until I was directly above the Bass, hoping to at least retrieve as much line as possible. In the clean water I could see that the entire 1.7m spear and fish had gone down the Bass’s throat. The only thing sticking out was the spear tip with the barb open by the cheek. I tried to wrestle my Queen Fish back, the Bass yanking me down and fighting with amazing power. Eventually the Bass, christened Rosalina by the locals, spat the fish and spear out. I pulled it up, still on the spear and got it on the boat. That was our cue to call it a day. After a day of bad weather, we only had one more day left of the trip. That last day dawned with a clean sea and settled weather. 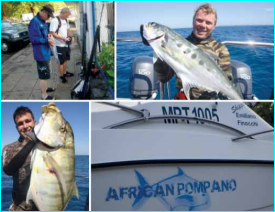 We were off to visit Neptune again, once again with Emiliano and his boat African Pompano. The last day saw us undertaking some deeper dives on a variety of fantastic reefs and open water. The highlight of the day was Grant shooting a beautiful Sailfish with only a 1.2 Freedivers reel gun. He filmed his reel being stripped empty in about 8 seconds, before the gun was ripped clean out of his hand with no belt reel to attach. Fortunately the spear came out so he managed to get his gun back. Later, Grant shot a very big Green Job Fish on Jeremiah’s reef, but it reefed itself up. We could only watch while a reef shark swam under the ledge and bit off the whole back of the fish leaving only the head, still attached to the spear, to be pulled up. At the end of the day we stopped off at a lighthouse in 10m of water, situated on a sand bank near the end of Maputo Bay. The visibility was not great, maybe 4 to 5m, and fairly green. However, it’s a great place to dive because if you dive onto the sand and lie near the wall, the fish regularly patrol around the lighthouse. Species we spotted included Pickhandle Barracuda, Golden Trevallies and some Grunter. All of us landed a couple of nice fish at this spot. That was the end of that trip, and we went home the following day. But the story couldn’t end there and I just had to get back. I kept in touch with Emiliano and arranged to join him over the same time a year later. For my fi rst morning’s diving, Emiliano and I were on the water at 6:30am, earlier than usual for Maputo. We were off to the northern reefs situated in Southern Billene, over 50kms from our base. On our way to the reefs, the water was so clean that I could see the light reflections on the sand 25m below. Myself and Luis, one of the dive crew, were just commenting on the water when we began to see loads of fish swimming below us. We shouted at Emiliano to stop and we looked overboard. Immediately a school of Queen Fish swam right up to the boat. The skipper did a few small circles until he found some reef on the sounder. Within moments we were all kitted up and in the water, and what happened over the next hour or so was amazing. The fish were not skittish at all and would allow you to swim straight up to them. I managed to shoot 2 Pickhandle Barracuda and 2 Golden Trevally, all over 10kg. At one stage I was down at about 10m and a very big Pickhandle swam over my shoulder. I turned to swim level with it and was getting ready to shoot when I saw Emiliano coming down on top of it. He had a great shot so I decided to film the fight. What happened next was quite scary. As Emiliano pulled the line in, the 12kg fish locked its eyes on him and swam straight at him with jaws snapping and bit into his fi n blade. Emiliano kicked it away before it could bite into flesh. The fish then came around at quite a speed for a second attack and again Emiliano deflected it with his fins. I managed to get a head shot in before it succeeded in biting him. After it was in the boat, we continued diving amongst the hundreds of fish around us, and all boated some good fish. Given the strange behaviour of the fish, it wouldn’t surprise me if that reef had never been dived before. Every reef we dived that day had heaps of fish on it, both bottoms and gamies. At one stage I was literally swimming through a school of 50 Black Tip Kingies of 6 to 7kg each, to get to a big Parrot Fish that I had seen just off the bottom. At the end of the day I had 7 fish, with a total weight of over 70kgs, and everyone else had similar bags. The only reason we stopped was because we ran out of space in the hatches and had started to load fish onto the deck. However, we knew that our bounty would be greatly appreciated by the staff back at the Naval Club. Even though it is plentiful, fish is expensive for locals to buy. Our gift of fish made for some very happy workers; seeing the delight on their faces was a great end to a great day. Unfortunately after only one dive I had to cut my trip short to attend to family matters. Nowhere near satisfied, it was only a matter of 2 months before I was back on a bus to visit Emiliano for 6 days over March/April. First dive day and it was off to a reef that I had been hearing stories about from Emiliano ever since my previous trip. Emiliano, Luis and I headed straight out to sea, slightly northwards of Inhanca to a reef that comes up to 55m but is over 50km out to sea. What an incredible location. Rainbow Runner were the bait and you could find them by sight, a typical huge boiling bait ball tinting the water darker due to the sheer mass of fin. As we jumped into the water, 3 Wahoo were directly below us swimming towards the fl asher. I had no time to load my gun or hit my camera’s record button before Luis had swum down and had his spear into a 22kg fish with Emiliano getting another fish off the other side of the boat. Emiliano managed to boat his fish before Luis, and before he could reload another Wahoo was next to him. He shouted to the gillie to throw him his reel gun, loaded the 2 rubbers and shot the fish. It quickly stripped his reel, but luckily just before his belt reel emptied the boat gave him a buoy. I was following Emiliano with the camera running and gun in hand in case of sharks. Only about 20 minutes in the water and 3 Wahoo, all around the 20kg mark, were already on the boat! With a short break to wind up the 150 odd metres of reel line, it was back up the drift. As we approached the Rainbow Runner I subbed and a 12kg Couta swam into range. I took the shot, spined it and brought it quickly to the boat. Just as I was about to grab it a nice Wahoo came up to me, leaving me wishing I had a second gun. We did a few more drifts, missing the target a few times. Unlike a normal drift over a pinnacle, the target is the bait column and it is always moving. Despite this, there were still always fish around. One such fish was a small (for this place) Couta which Luis shot. It went straight down, as he pulled it back up a very big GT came up with it. Emiliano tried to put a spear into it but it was a long shot and the spear tore out, coming back bent after a short tussle. On the last drift at this spot we hit it just right and came straight onto the bait column. I had said to myself that I would not shoot my gun again unless it was at a Wahoo, until a big Couta swam up towards me and changed my mind. I subbed and put in a good holing shot. I was able to retrieve the fish quite quickly as I was using blue water bungie line, which does a lot of the work for you. I boated the Couta – just short of 18kg. Not a wahoo but still a good fish! We decided to move onto some of the shallower reef, but it was all quiet. Luis managed a medium Couta but that was it. At our usual home stop off, there were a few fish around but the current was strong and the diving tough. Emiliano shot a nice GT but it cut him off on some sharp structure. I continued to dive for a while but as there was a major storm brewing over the land, it was soon time to leave. It was a good thing we decided to end the day when we did. We had to navigate the last 10km back to Club Naval using only the GPS, due to heavy rains and poor visibility. Nevertheless, it made for an exciting end to a productive day. Once again the trip was prematurely over, this time thanks to a severe front that moved in and was due to hang around for a few days. Although it’s always disappointing having my fun cut short, it’s really okay. When a trip comes to an end, it simply means that once again the wheels are in motion to plan the next one. And there’s nothing disappointing about that.